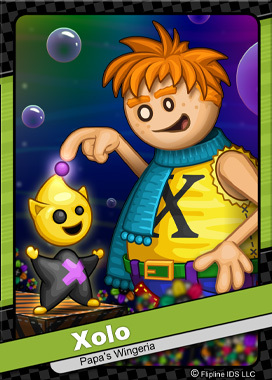 Xolo and his twin sister, Xandra, were being raised by the Xeppers to be the Royal Guardians of the Warp Coins. However, that all changed on one fateful night when a crystal-like asteroid with a faint pink tail was observed hurtling through space. It was on a collision course with the Kingdom of X, the core realm of the entire Flipverse. The Xeppers quickly patched together an escape balloon, and sent the twins off to the safest realm they could find. The stone pierced the sky and shattered the Kingdom of X, scattering all the sacred Warp Coins.